Our favourite Discovery Series instrument so far, India sounds absolutely breathtaking. Fun and flexible, a fantastic all-round package. You could lose yourself for months in this 3GB (7GB uncompressed) Kontakt library. 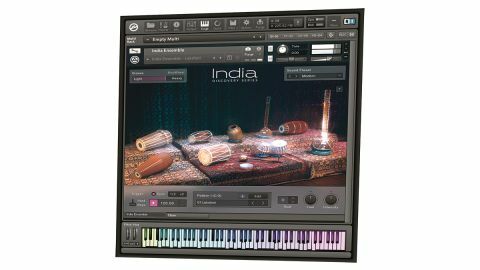 Its 16 NKIs cover a broad traditional instrumental line-up - tabla, dhol, ghatam, mridangam, harmonium, sitar, etc - and include an Ensemble patch that brings all the instruments together. For the percussion and Ensemble instruments, the lowest octave triggers a bank of 12 assignable patterns, chosen from an extensive collection. Each pattern is open to a degree of tweaking and editing, and is exportable as MIDI via drag and drop. The percussion NKIs also map fills and ornaments across the keyboard alongside single hits, while the melodic instruments use keyswitches to change articulations, and include an adjustable tampura drone. The keyboard can be snapped to a huge range of Indian and Western scales, all customisable in terms of notes and ornaments. In the Mixer page, the rack of channel and master effects comprises reverb, EQ, filtering and saturation.